You guys... I can hardly believe it, but I've finished up my first year blogging! It's my 1 Year Blogiversary! 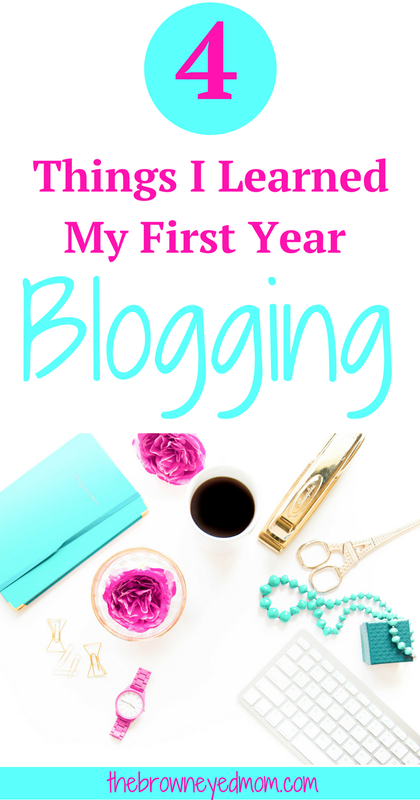 Over the last year, I feel like I have learned so much as a blogger! It's definitely a lot harder and a ton more technical than I ever thought it would be. But, all in all, I've had so much fun and learned so much. Now, I want to share that knowledge with you. Especially my newer blogging peeps and those of you contemplating starting a blog! Just as we need our mom tribes in everyday life, we bloggers also need our blogging tribe. Those other bloggers who support you, answer your questions and are there to cheer your wins and encourage you during failures. As I mom blogger, I found my tribes and it did so much for my confidence as a blogger. I also did a round-up post of my 5 favorite Facebook groups for mom bloggers. These groups have been so important in my blogging journey and have helped me more than I ever thought possible. Having a blogging support group is a MUST. I remember when I first got started, I had really no clue what I was doing. I read a blog post about Facebook Groups for bloggers and found Blogging With Heart. It was so refreshing to find other women bloggers who were and still are so supportive of each other. If you're looking to start your blog or have just started, FIND YOUR TRIBE! They will be there for you in the highs and the lows and help you find your footing as a blogger. All the big bloggers will tell you to "niche down" and find your audience. But what happens when your audience all wants different things? You become me. A mom blogger that writes on differing topics for her audience. I really didn't know just one direction I wanted to write when I first started. I started with posts on being a SAHM, parenting, homeschooling, Christianity, natural living and mom organization. As I really started to look at my audience and what posts were doing well (and which ones weren't), I found most of you want to hear about all things motherhood and blogging. While I still write on all those topics, motherhood and blogging have won the masses (if you want to call yourselves the masses... Lol). So, for the time being, I'll be focusing more on those 2 topics than the others and see where things go. It's not as easy as some bloggers will lead you to believe! I hate to burst anyone's bubble, but blogging is hard. Yes, there are many out there who have "made it big" blogging. But if you look deeper, most of them did not become overnight successes. I have seen countless blog posts on "How I Got 10K pageviews my first week blogging!" and such. They're either bending the truth a little or are extremely rare and lucky. Being a successful blogger is not just as simple as writing a post, hitting publish, and sitting back watching the views roll in. There is SOO much that goes into it beyond that, especially just starting out. Now that I've been at this a year, I can write a few posts in advance, get my Tailwind queue set up, and take a few days to not really do any promotion without seeing my blog views plummet. There was no way I could do that in the beginning. I was literally writing posts week to week without getting ahead. Graphics were made the day before the post was to go out on PicMonkey or Canva. And then it was promote promote promote in every Facebook group and Pinterest group boards I was apart of. It was exhausting. But, fulfilling! Now that I've been out there a year now, I can take it easy some weeks without there being a huge difference in traffic. To all you new bloggers out there, yes, there are bloggers who became successes seemingly overnight. But they are really a minority! It takes a lot of hard work and, honestly, sometimes a little luck. There is not a one size fits all course or e-book that will make every single blogger a success overnight. While there are great courses out there (like Pinterest Ninja, my favorite! ), not every single one of them is going increase your income or traffic overnight. My advice? Join blogging Facebook Groups, check out authentic reviews of courses your interested in (that have proof of the course that was used really was working for them and not just a quick "This is great" post with an affiliate link! You can check out my review of Pinterest Ninja here. ), and find what will work for you. It takes time and effort! I really love writing and graphic design! If you've followed me for any amount of time, you probably remember me mentioning I used to be a pediatric registered nurse before I became a SAHM. I've always loved science, kids, and how the human body works so being a nurse wasn't much of a question for me. Now that I'm home and blogging, I didn't realize how much I loved writing and graphic design! My husband is more of the creative type who has a degree in computers and a minor in graphic design. But he's on a totally different career path than his degree and I guess now I am too! Once I really dove into blogging and got serious about it, I set out to brand myself. And it's been a blast! I never thought of myself as a creative type, but I could seriously get on Canva or PicMonkey and create images all day long. Not even lying. I've even thought of offering VA services for graphic creation. Maybe one day! So, my advice for new bloggers? Yes, it's awesome to make money with our blogs. But don't get so wrapped up in writing content that you hope people will buy from that you lose sight of why you started blogging. Stay true to yourself. Only promote things you actually use and love. Write what comes naturally to you. If you get stuck, save the draft of your post and move on for a while. Thank you all so much for joining me on my blogging journey! It has been a great year and I can't wait to see what this next year holds!